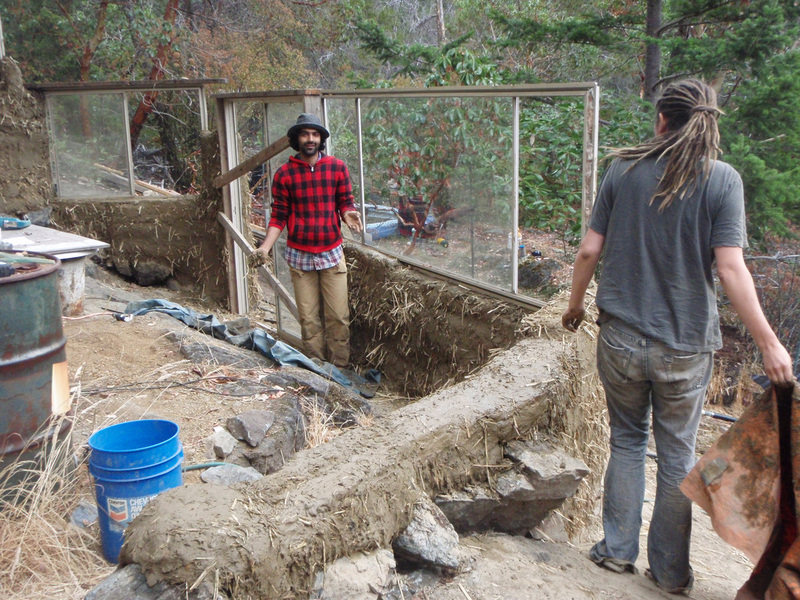 Our 2015 Cob Building Workshop Dates! You can take 10% off our regular workshop price if you travel carbon-free to the workshop on Lasqueti Island. 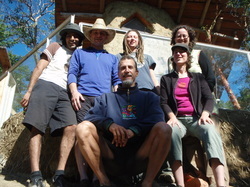 All 3 workshops were a resounding success in 2014...thanks to all who participated and contributed your amazing energy and interest in Natural Building and for walking more gently on our beautiful planet. Our week long workshop offerings...for 2015! Beginning on a Saturday evening for dinner, and ending on the following Saturday with breakfast, we continue our 9 year tradition of hosting Natural Building and Living Workshops. 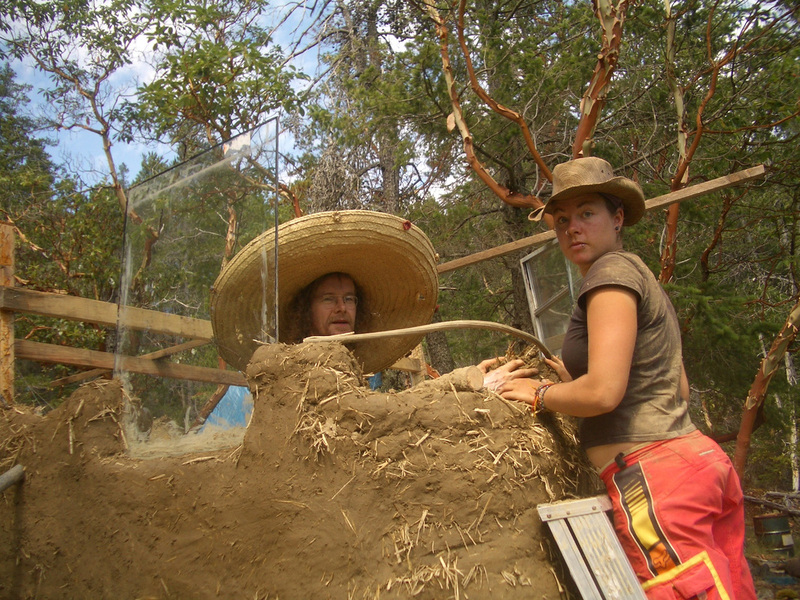 Finishing Natural Buildings: we use a natural plaster that is easy to work with. Finishing a two story house: a 30' x 50' structure with a partial 2nd floor. The main house now has an Ondol (Korean-style) under floor heating system and stone and 18" cob wall foundation; we'll be building the cob floor, integrating plumbing and electrical, building a "cob fridge" and installing lots of glass and built-in features as well as a metal framed solid wood door and dual glass doors. Exploring how to set up a comfortable life Off-the-Grid: we'll look at many ways to collect rainwater, use greywater, create a garden site and forage wild foods. All systems we will look at are created and maintained without fossil fuels, using human, solar, and micro-hydro power. Naturally plastering walls: you’ll find the ratio of materials that work best for applying and lasting, which can be used on any type of construction. Travel days to get to and from the workshops are Saturdays: we’ll begin with a welcoming, wholesome dinner the first evening and end with a farewell breakfast will fuel your return to the ferry dock the following Saturday/Monday morning. The pace is casual but determined; the more effort you give, the more learning you will take away. Natural Building is at least 95% experiential learning and you will be expected to self-motivate throughout the 5 daily scheduled sessions. The cost of these 6 day workshops is $800 which covers all meals (3 hot vegan/vegetarian meals prepared for you for 6 days, plus a welcoming dinner and a good-bye breakfast), on-site camping with running water, and hands-on instruction. We use locally-grown, organic ingredients wherever possible. Any two people who register together receive a $100 discount (i.e., $1,500 for two spots). Previous participants receive $200 off each workshop. A person is considered registered and a spot in your choice of workshop is held for you ONLY after an application is submitted and a non-refundable deposit of $200 is paid. Although extremely rare, sometimes powers greater than our own prevent us from doing what we planned. If you find yourself unable to attend the workshop you've registered for, here is our cancellation policy: more than a month's notice, 100% refund minus the non-refundable deposit; 1 month to 2 weeks notice, 50% refund; 2 weeks or less notice, no refund. Obviously, please let us know if you have to cancel, and we'll do everything we can to help you recover the non-refundable costs of the workshop. We run these workshops on a very tight shoestring, so we simply can't give full refunds at the last minute and continue to offer the workshops. We hope you will understand. Please also note that women and families are especially encouraged to apply. Barters or trades are always possible. What else makes these courses special? You will see firsthand how humans can build with what nature provides, without destroying the beauty that is offered. You’ll also have many opportunities to master making cob itself. You’ll learn the “traditional” technique, known to cobbers throughout our wet coast, and we’ll learn how to modify it so that you can mix up to 10 times faster! You’ll experience building walls the “old fashioned way” as well as “the brick” which gets them up as much as 30x faster! Not only will you learn how to build naturally and affordably, you’ll learn how to do it efficiently enough to be empowered to build on your own and keep your community of builders interested and inspired to keep building with you. "Instruction was excellent. Dave knows and lives cob and this is evident in his responses to questions posed by workshop attendees. His approach is knowlegable and professional in a gentle, patient and accepting manner. Dave is clear he still learns something new every day he cobs and welcomes new ideas and approaches toward cobbing. He believes we all bring something new to the table and is genuinely excited (in his calm way of course!) when we have a suggestion or idea which makes an aspect of the cob process easier." “Transformative and empowering!” – Kate ’10. “Very instructive and hands-on.” – Matt ’10. “You have no idea how excited I am that I now pretty much know how to build a house out of dirt.” – Kate ’10. “Learning what we needed to know as we put it to practical use rather than spending a lot of time on theory was a useful approach for me.” – Terry ’09. 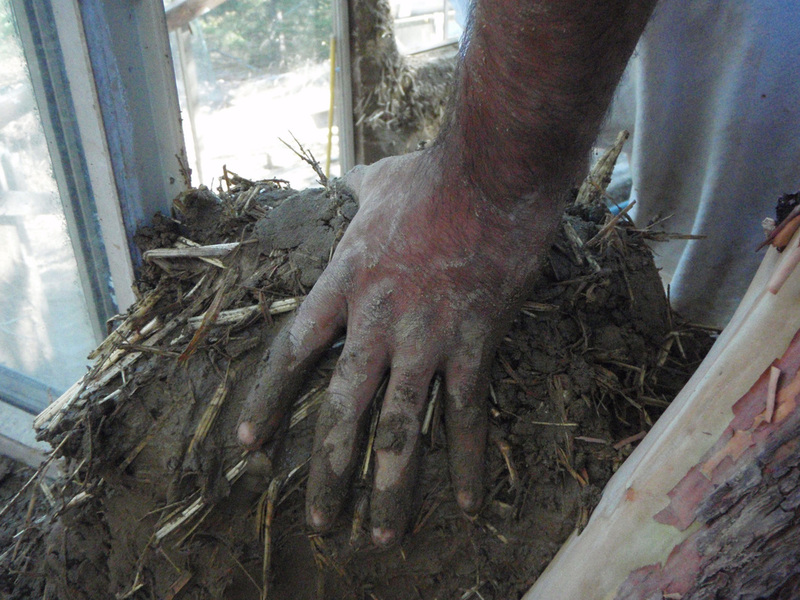 Dave Olsen completed a cob workshop led by Ianto Evans in 1996 and has had mud (and sourdough) on his hands ever since. 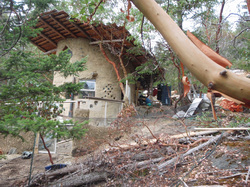 He began hosting Natural Building workshops in 2007, began instructing the revolutionary "Fast Cob" mixing and building methods in 2009, and turned 50 in 2013. Based on off-the-grid Lasqueti Island, he also hosts an apprenticeship that goes well beyond Natural Building, helping younger people develop responsible and environmentally sustainable lifestyles with enjoyment and ease. Dave has been very fortunate to have worked with many of the leading cob builders of our time and to have a dynamic, cob- and bicycle-loving daughter (and dog!). Please briefly answer all 5 questions. Here’s hoping you can experience the beauty of natural building and cob soon!